Have you seen the TV commercials? Here's one (click here if you don't see the image). The second line of thought is different. It's not public. It's common sense business people working in an evolving ecosystem. Advertising is an evolving ecosystem, make no mistake about it. The ecosystem changes all the time. One day you have a free audience on Facebook, the next day you're paying Facebook pennies to speak to the free audience you cultivated on your own, and the day after it is too expensive to talk to your audience on Facebook, causing you to shift advertising dollars to (gasp) television. This doesn't mean that television is back, much in the same way that it doesn't mean anything that JCP mailed one (1) catalog. It's just an evolving, bubbling ecosystem, where smart people are looking for inexpensive solutions to reach people. The smart people are first, they get any (if any) benefit that exists, and then the masses come, driving up prices, getting less for their dollar. When the masses arrive, the smart people have already moved on to something different. That's why they are smart people! In my projects, I see those who analyze, and those who "do". Those who analyze are always late to the party. They worry about getting an attribution algorithm just right. 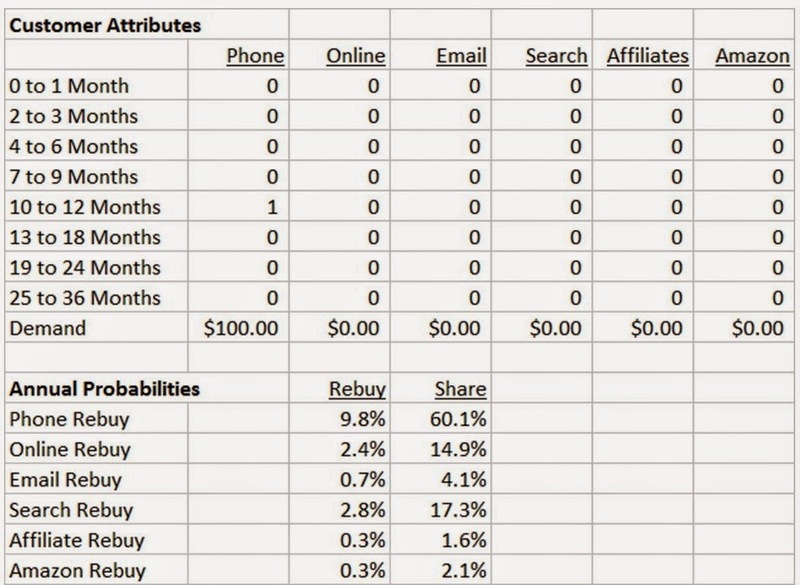 They spend four months evaluating attribution partners. They argue about the right way to define things. Those who "do" try television. They just try it. They don't even bother to see if sales should be attributed to television, they just move, constantly. If television works, sales increase, and every person in the company can plainly see it ... no need to parse the solution out in a complex mathematical attribution algorithm that may well be wrong in the first place, an algorithm that ultimately feeds a larger data-intensive ecosystem that truly benefits the algorithm creator more than the algorithm user. Hard work is coming, folks. Twenty years ago, the internet was new and exciting and new business models were created upon it. Growth was easy. Key innovations since has been less effective at driving sales increases (search, social), requiring the internet to cannibalize offline activity to grow. We have no idea how mobile will turn out. So until we see how mobile turns out, there's a period of intense, hard work required out of all of us, hard work that won't necessarily yield positive results. Here's an example of the hard work that is coming ... Uber delivering for companies like Neiman Marcus. Will Neiman Marcus experience a sales increase? Highly unlikely. Are the testing something? Are they following the herd? Do not follow. Following is expensive. Do not wait. Waiting is expensive. Try something. You need new customers. Try something different. When it doesn't work, move on, don't bemoan the fact that it didn't work, celebrate that your have a culture willing to try things. If Airbnb tries television, and they're lauded by the digerati, shouldn't you try something different as well? Try. Take a look at this email marketing campaign. Are the top two pair of shoes sold out? Who knows? Who cares? What we know is that this is a marketing tactic designed to get you to buy either of the bottom two pair of shoes, right? What happens after the customer purchases one of the pair of shoes? 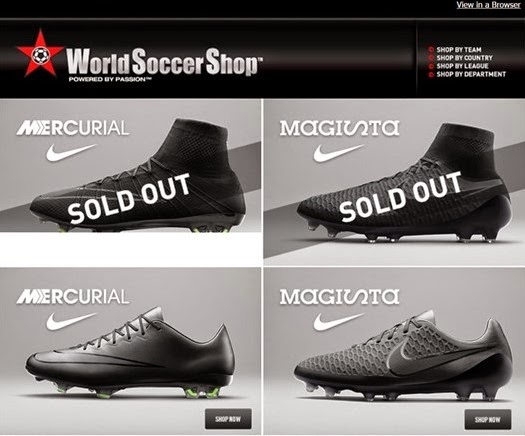 Well, World Soccer Shop generates profit. Nike generates profit. The email marketing team gets closer to earning a bonus. The merchandising team gets one step closer to earning a bonus. The analytics team measures the future value of the customer. Vendors attribute the order independent of bonus structure. 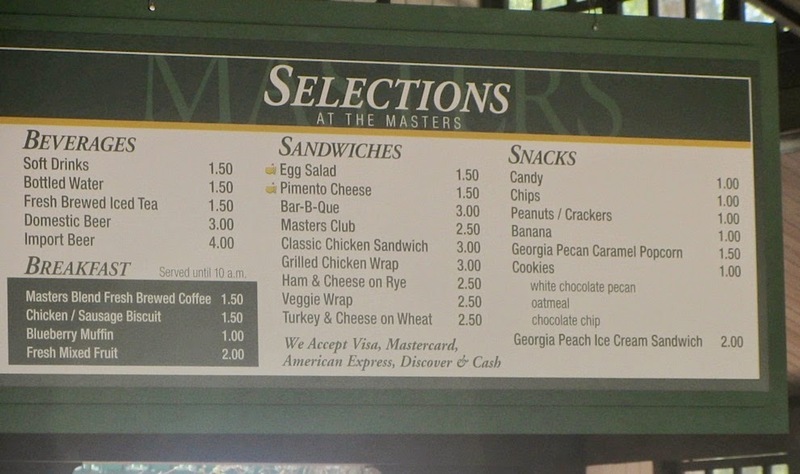 But what happens to the customer? What does the customer purchase next? Few people know the answer to that question, and for good reason. Almost nobody measures the big 'ole bubbling ecosystem known as our "brand". In project after project, the act of causing a customer to buy a specific item changes the trajectory of the customer ... usually for good ... sometimes the outcome isn't so good ... but almost always, the impact is not measured. Measure the impact. Contact me (kevinh@minethatdata.com) if you cannot do the work yourself. It's important work, no doubt about it. The article header says "amid strong sales" ... then the author buries at the bottom of the article the fact that retail comps were -1.3% (i.e. the opposite of strong). Though to be fair, currency changes do impact business. The ad agency running the "disconnect from mobile" campaign then encourages users to use mobile to share their "disconnect from mobile" experience with their friends. Maybe you just took over a department? It's your first crack at dealing with ten or more individuals. 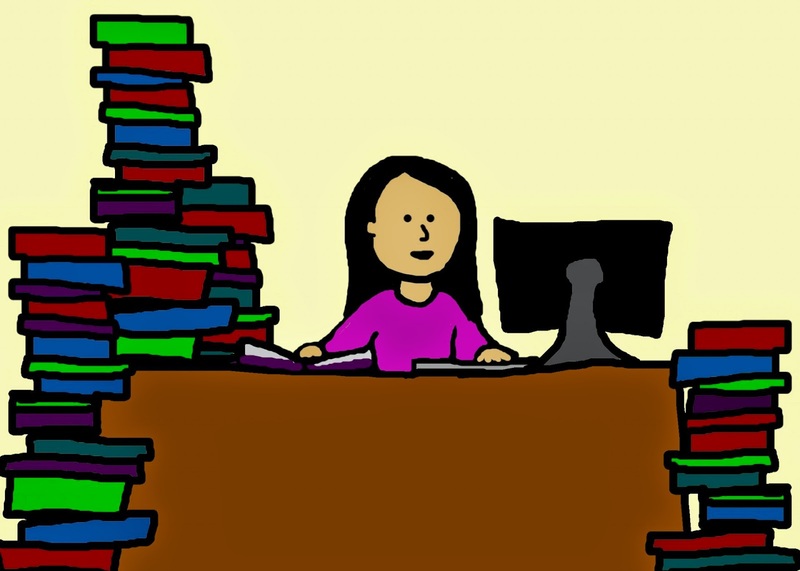 You probably feel overwhelmed, like the new Director of Marketing in this image. But you're also optimistic and talented, like the new Director of Marketing in this image. The first ninety days in this new job are the most important ninety days, make no mistake about it! I took over a department at Nordstrom Direct, way back in 2001. On my very first day in the job, a pair of individuals entered my office, and asked me to fire a person. Within a half-hour, the person who these folks wanted me to fire entered my office, and asked me to fix the department. Who do you think I sided with? And what do you think those introductory statements said about each employee? Make it clear to each employee you inherit that you are using week one to "evaluate and plan". You are not making any decisions that first week. You are getting to know people. Observe work habits. See who leads in meetings. Who gets along? Who hates other people? Who gets run over by other departments? Who produces accurate work, and who produces inaccurate work? Who produces, period?! Document everything. Sit down with your Human Resources team, and ask for all performance reviews. Also ask for documentation about each employee ... stuff like interpersonal problems, office relationships, problems with the law, the whole nine yards. Some of it will read like an episode of Downton Abbey. Create annual goals and objectives for each employee. These are the goals and objectives you will use to evaluate each employee. Set expectations from day one, folks. Then, every Monday morning, produce a dashboard that shows how your department is progressing against your goals and objectives. If you take over on a Monday, make sure you have a mandatory department-wide meeting the following Monday. Have somebody from Human Resources in the room - this sets a tone that you are dead serious about having a well-functioning department that works with honesty and integrity. It also prevents inaccurate gossip - you don't want the malcontents on your team to go out there and publicly lie about what was said in the meeting. We are a family. We love each other. When we disagree, we disagree internally. Publicly, we are a unified and confident team more than willing to defend the work of each individual in the department. Say whatever you want in my office and get it out of your system. We are here to generate a ton of profit (I then outlined goals and objectives and told everybody what work they would focus on for the next year). We are going to work hard - no more three hour work days. We pursue excellence and innovation. Our work is accurate and trustworthy. If you are not on-board with this agenda, please go find a new job as soon as you can. You'd think a message like that would be well-received. The message was received much in the same way a hive of bees would receive a dozen rapidly fired darts at their queen. Oh, the message created a buzz alright. One employee asked me to "make things like they used to be". Another quit. Then another. Then another. After your first two weeks, you can begin the process of building the department in your image. Do not copy Steve Jobs, or your Mentor. Do it your way. Pay attention to those who are not "onboarding", to use a term a former boss enjoyed using, and determine why they are not onboarding. Each week, reinforce your message via your dashboard. Show every employee where the department stands against goals and objectives. Reward those who adopt your program. Overpay for talent now, because your compensation department will put the clamps down on you soon. Make it clear to everybody else that they are not meeting expectations. Hire folks who you trust, who are talented, and who implement your program. Always communicate - and repeatedly communicate the same message. Your employees seldom hear what you want to communicate - so the same message said 137 times has a better chance of being understood how you want the message to be understood. Once you get past your first ninety days, you've begun to put your program in place, and you'll learn quickly whether you are going to be successful or not. But those first ninety days are critically important - the most important of any period. Make good use of your first ninety days. Allow me to tell you a brief story. Let's go back to November 1990. Yes, 1990. I was in my first week of work at Lands' End. One of the aspects of my job (statistical analyst ... today that job would be titled a digital analyst or a data scientist or a growth hacker) was to audit my statistical models. I submitted a request each Friday to print the customer purchase resume of one of every ten-thousand customers. Over the weekend, the customer file was scored, and when I arrived at work on Monday, a stack of printed customer records magically appeared on my chair. Every Monday morning, I thumbed through each record, hand-calculating that my scores were being applied properly. The best part of the process was to watch how customer behavior evolved. Not overall customer behavior, but rather, the behavior of an individual customer. I can still remember customer # 1000004 ... her record was always on the top of the stack (no, I am not going to share her name with you, though I can still remember her name). She hadn't purchased in a long time, so every Monday there was drama ... had she reactivated over the past weekend? Every marketing employee should be required to look at a customer resume. Every one. What do you see when you look at the resume at the beginning of the post? Be honest. Study it. How does this customer behave? This isn't much of a "digital" customer, is it? Or a seasonal customer. But this customer is a very, very good customer, make no mistake about it. So enjoy this customer - quit demanding that this customer engage with you digitally. Collect profit. Ok? By the way, there was a Friday back in 1992. I submitted my request to print one out of every 10,000 customers ... except I typed in 1 in every 100 customers. On Monday morning, our IT team, who clearly saw the request and knew I made a mistake, elected to initiate a "teachable moment" and dutifully printed the resume of one out of every 100 customers. They deposited the 40,000 sheets of paper in my office. You learn a lot when you audit your model scores, don't you? Click here, dear catalogers (right here). This person talks about his startup and finding customers on Facebook. When performance (due to cost) struggled, he decided to go find new customers elsewhere. 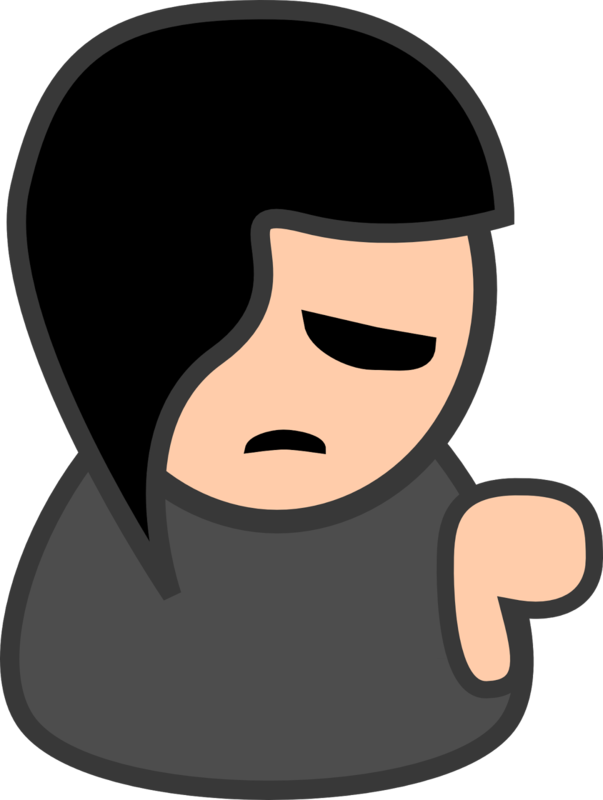 The next time your favorite co-op shows even further reduced performance and takes your names for free and sells them to an online brand to help the online brand put you out of business, why not do something about it other than complain? Do what this individual did - try something different. Modern customer behavior is perceived to be much more complicated than it was twenty years ago. That may or may not be true. Twenty five years ago, you created several hundred RFM segments and you called it good. Today, your three hundred RFM segments would overlay against twenty marketing channels, getting you ever closer to an infinite number of segment combinations. Is it any wonder folks want you to have a "one-to-one" relationship with a customer? It's become hard to segment the customer in a meaningful way. It is perfectly reasonable to simplify the number of dimensions you deal with. I create simple models ... in the case above, a model for a product line called "Widgets", and a model for a product line called "Wudgets". The predictions for each model are reduced to five segments ... sort of like when you were in school ... A/B/C/D/F. Then, I measure future "Widget" spend across the A/B/C/D/F grades for "Widgets", and A/B/C/D/F grades for "Wudgets". In other words, let's pretend that the customer is a prior "Widgets" buyer, but has never ever purchased "Wudgets". We'd look across the "A" row for Widgets, and then align with the "F" column for Wudgets ... the customer is worth $44.38 to the Widget merchandise category. 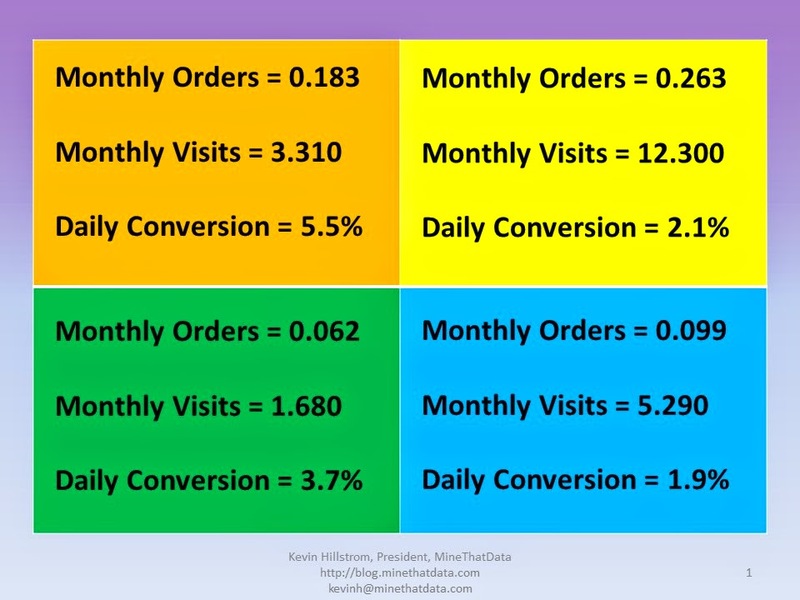 Say you have an email marketing campaign for Widgets ... you know that the customer must be worth at least $30 of future spend to generate a productive Widget email campaign. Even if the customer has not purchased Widgets in the past ("F"), a recent Wudget purchase might move the customer into A/B territory for Wudgets ... and when that happens, the customer has sufficient value to email the Widget campaign. Better yet, you can build Wudget purchase intelligence into the Widget model ... and by doing so, you eliminate the need for the grid altogether ... you trigger/target based on the Widget grade. Let's say I want to move 13-24 month 1x buyers to a second purchase. How much might I be able to spend to make this happen? In our table, the average 13-24 month 1x buyer is worth about $13.50. 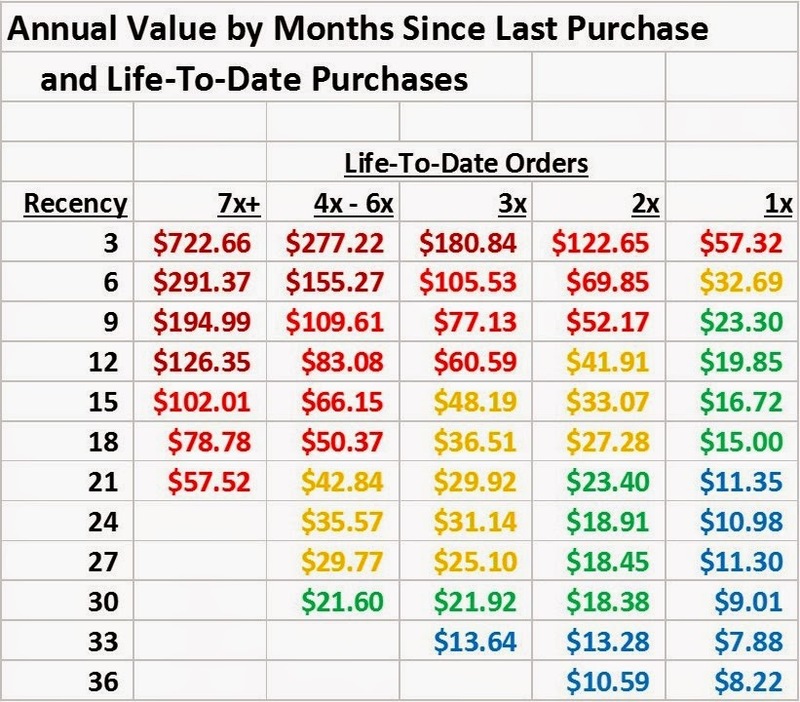 In our table, the average 0-12 month 2x buyer is worth about $71.65. Intuitively, you might say that you gain $58 of value, so you can spend a fortune. There are two things we need to know. 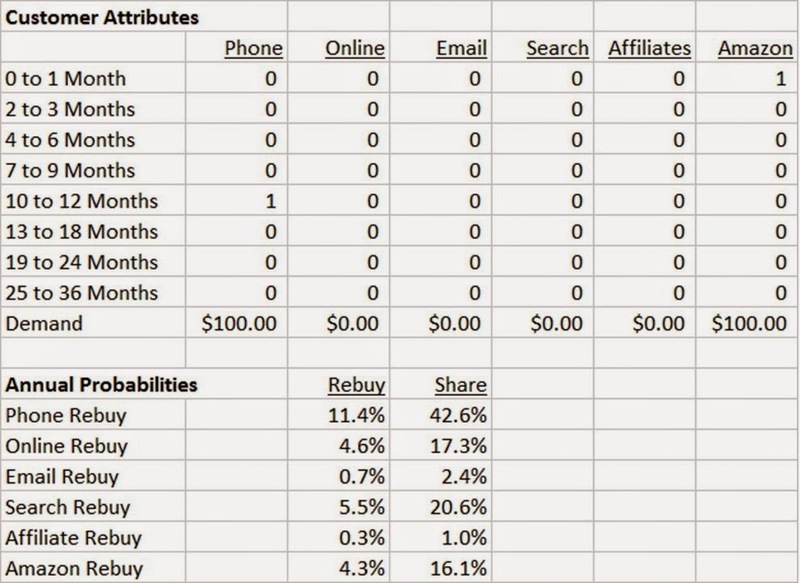 Actual repurchase rate of 13-24 month 1x buyers. 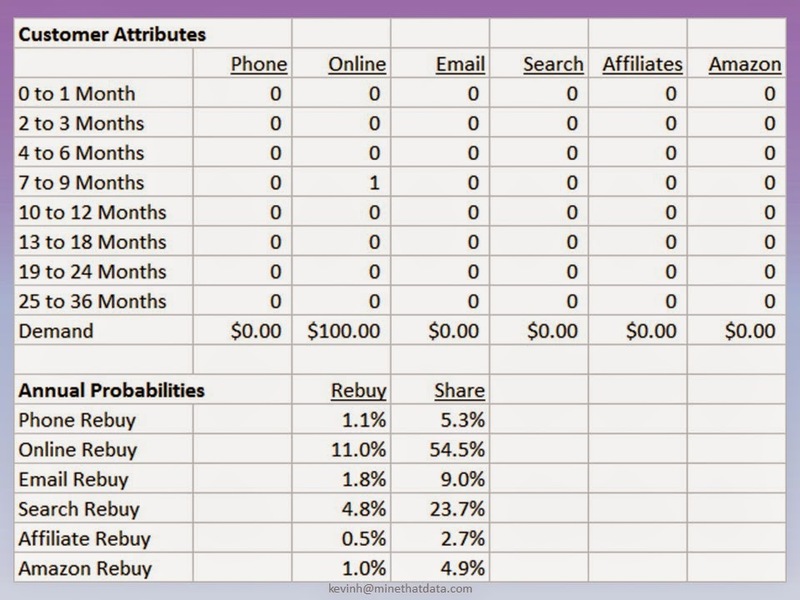 Incremental percentage that we will convert with incremental marketing activities. Percentage of demand that flows-through to profit. Let's pretend that the annual repurchase rate of 13-24 month 1x buyers is 10%. Let's also pretend that we can increase the 10% annual repurchase rate to 12% by performing various marketing activities. Finally, let's assume that 35% of demand flows-through to profit. We now have the pieces necessary to determine how much we can invest. 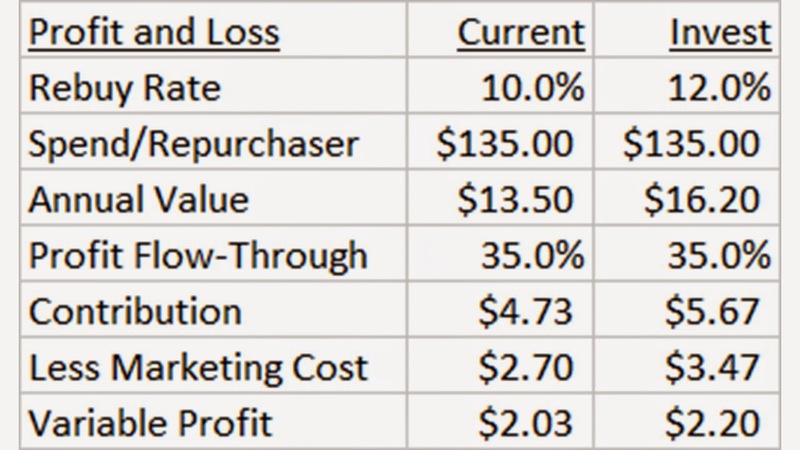 Look at the "Marketing Cost" line ... you could invest an additional $0.77 per customer, and if you can achieve a 20% increase in repurchase rate, the math yields more profit. This is how a modern marketer can leverage lifetime value style metrics to improve business performance. 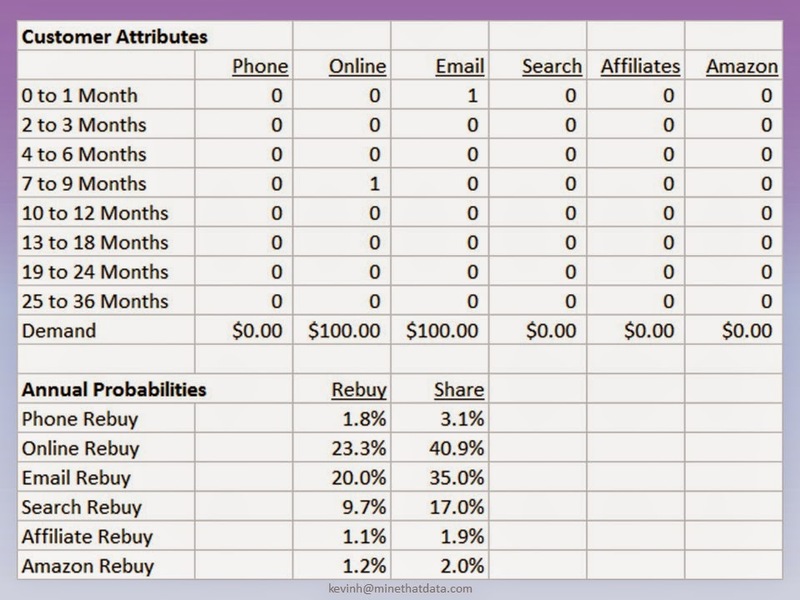 In our example (assuming that we can truly get a 20% increase in repurchase rates by marketing more to a customer), we are able to grow the active 2x buyer file - and that's a good thing, right? These customers will spend a ton of demand next year. Have your analytics team run this analysis for you today. If they cannot run the analysis for you, contact me (kevinh@minethatdata.com), and I'll gladly do it for you. Via the NEMOA website (click here for the article), you are told that co-ops "insist" that e-commerce brands contribute their names/transactions to the co-ops. "Insist" is an interesting word, because it gives pure online brands the opportunity to say "no", which they do (they tell me they say no), and when they say no, they get to rent the names you freely contribute - and the co-ops keep all the money. At least two co-ops sell your names to e-commerce brands. Ask a CMO at an e-commerce brand - fact check the issue for yourself! Then ask yourself why you are happy being ripped off? Via the print industry (click here for the article). 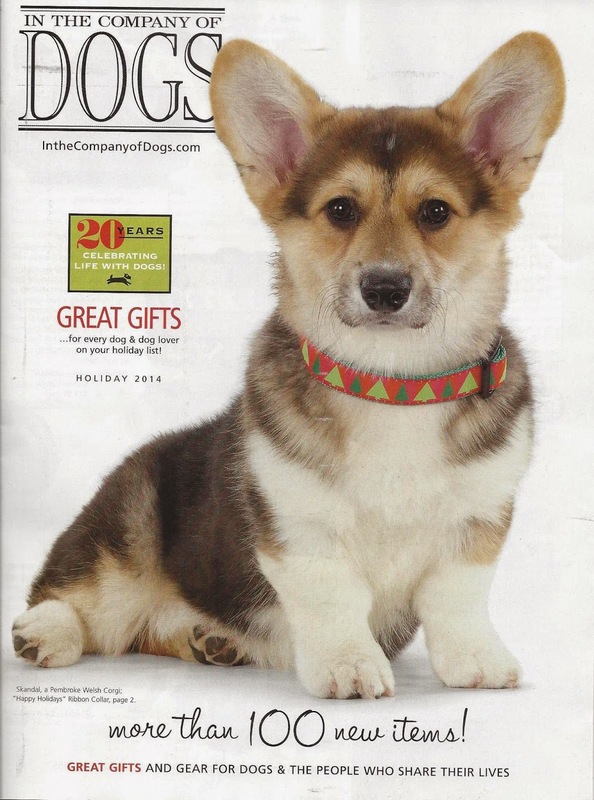 The article misleading states that catalogs in the mail are down 84% since 2007 (the DMA says the total is about 40% ... so either the DMA is understating the problem or the print-centric article is overstating the problem, either way, you have a trust issue, don't you? ), and then the author of the article blames you, the cataloger, for not having a strong enough presence on Capital Hill. We know the metrics are factually untrue. Catalogers struggled for two reasons ... the collapse of the global economy ... and e-commerce growth that rendered cataloging unnecessary for many customers. The reason is clearly not about having a strong presence on Capital Hill. My goodness. There are way, way too many good, honest vendors, printers, paper reps, trade journalists, industry conferences, boutique consultancies, and independent consultants out there. Way, way too many good ones. Kind ones. Honest individuals. Folks who work nights and weekends to make sure your campaigns get out the door. Folks who work hard to make sure that there are good presentations at conferences. Their reputation should not be soiled by biased, misleading, inaccurate statements that protect the financial agenda of co-ops and/or printers. When you begin your career, you gobble up information ... everything is new and interesting and you are a sponge, soaking up knowledge. If your career is measured in fifteen year thirds, then there is a point somewhere in the latter half of the first third of your career where you realize you have to find your own identity. You stop doing things the way everybody else does them, and you chart your own course (or not). There are six books that influenced my path. Statistical Methods / Snedecor and Cochrane (click here). I have a version from 1938. The book talks about the kind of tests that modern online marketers claim to have invented. Without Snedecor and Cochrane, Google wouldn't be what Google is. Did I mention that these folks wrote about stuff back in 1938 ... stuff that digital gurus love talking about today? Maybe everything new is old. Correspondence Analysis in the Social Sciences / Greenacre and Blasius (click here). The book illustrates ways to take a simple cross-tab table in Excel and map the relationships between the rows and columns. There is no better lesson than one where you learn that complex information can be reduced to simplified information. Modelling Biological Populations in Space and Time / Renshaw (click here). The most influential book of my career. The book explains how species interact with each other ... how wolves need/eat rabbits until there are no rabbits and the wolves starve, for instance. Everything in this book relates to modern channel interactions. You learn that e-commerce needs stores, but stores don't need e-commerce ... you learn that e-commerce preys on stores, driving store performance down, causing stores to close ... stores are rabbits and e-commerce is a wolf (and by the way ... e-commerce will be a rabbit to the mobile wolf, it's coming, and e-commerce folks choose to not recognize this, to their detriment). Once you draw the comparison, your view of the world changes - you are able to see the future clearly. Permission Marketing / Seth Godin (click here). You may have noticed that everything about my business model has roots in this book. The book offered a blue print for building a small business. Still does. Mr. Godin was a beloved guru - then he refused to play the social media game of engagement (like he could engage with 400,000 readers on a one-to-one basis) and so many marketers abandoned him ... but that's their loss. The Demography of Corporations and Industries / Carroll and Hannan (click here). This book parallels "Modelling Biological Populations in Space and Time", but looks instead at how industries evolve. For me, the "ah ha" moment was how you start with a ton of small businesses ... the small businesses eventually coalesce around a handful of winners who become huge ... and those winners are then defeated by a ton of small businesses who capitalize on a new technology or change in the system ... and then those small businesses coalesce around a handful of winners who become huge. This pattern repeats ... and is in the process of happening once again (mobile). 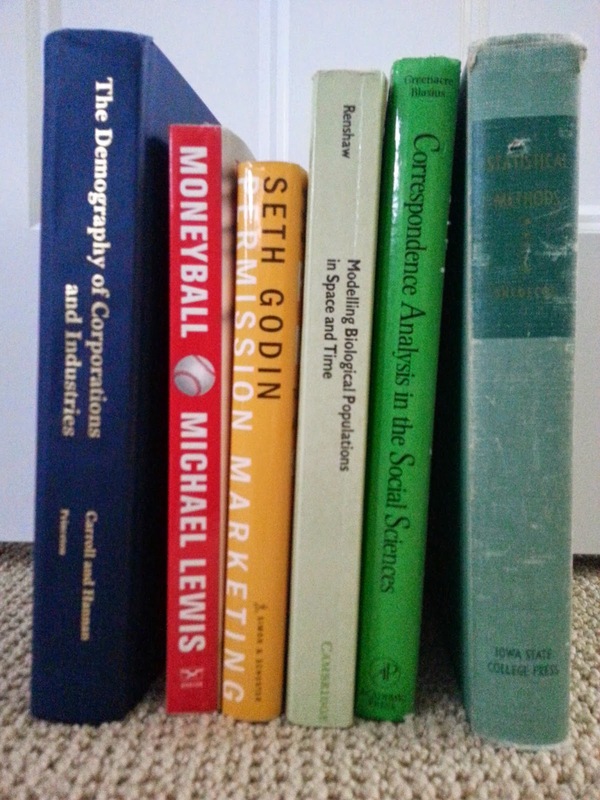 Moneyball / Michael Lewis (click here). I don't like this book because of the metrics. This book is important because of how it discusses culture. You can have all the metrics in the world, but if the culture isn't aligned, well, tough, you're not going to make progress. And here's a hint for the analytics community - you need an evangelist at a high level - people don't just accept your arguments and do what you say - the world doesn't work that way. Best of all - the book outlines how you can do everything right, and in the end, you don't succeed - and somebody with more resources steals your ideas and gets all the glory. I think it is really important to have your own "system", your own set of beliefs that you implement where you work, and then you experience success, success that you use to further build upon your own, unique system. You need to have your own way of doing things. Of what possible good is it to be a "Google Analytics" expert or an "omnichannel expert" when you are doing things that ten thousand people can do equally well? Craft your own way of doing things, provide value, and you'll go places.